Black people are leaving Los Angeles. The Los Angeles Black Worker Center noticed the trend while doing community organizing work in the area and teamed up with the UCLA Labor Center to conduct a study. Together, they analyzed 2010-2014 data from the American Community Survey and found that employment conditions have a lot to do with it. While the Black community was once a thriving part of L.A.’s landscape and remains integral to the county’s cultural and economic life, they are in the throes of a bona fide jobs crisis – and concern for Black workers has only intensified in response to the new administration. 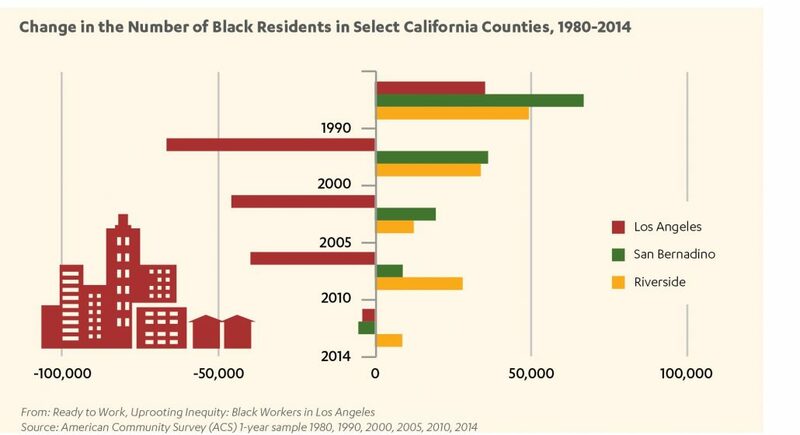 Based on their research, the UCLA Labor Center, Los Angeles Black Worker Center and the Institute for Research on Labor and Employment released the 2017 report Ready to Work, Uprooting Inequity: Black Workers in Los Angeles and a follow-up California study, as Black Angelenos still make up over one third of the state’s Black population. The report argues for the need to stabilize Black families and communities through community-driven public policy and corporate practice change that create good-paying, quality jobs accessible to Black workers. Its release was also coupled with the launch of a local anti-discrimination enforcement campaign called #HealBlackFutures that would support policy efforts to respond to discrimination complaints (additional research supported this need for local enforcement). As a leading global city, Los Angeles already has an important history of worker organizations and movements that have struggled to close the equity gap, increase the minimum wage, secure paid sick-days and provide a platform for worker voices. Since the release of this report, there has been an unprecedented display of Black working-class activism and mobilization in Los Angeles County. In addition, the governor of California also directed the Department of Fair Employment and Housing to establish a civil rights advisory group composed of relevant state representatives, community advocates, employers and employees to study the feasibility of authorizing local governments to help enforce anti-discrimination statutes. Studying Black workers in Los Angeles provides a helpful foundation off of which to both produce new research and develop policy initiatives addressing the state of U.S. labor in general. Evaluating the feasibility and clarifying the steps that local authorities are taking to remedy civil rights violations will be critical in curbing unfair treatment at work both in Los Angeles and on a larger scale. The Los Angeles Black Worker Center is a grassroots action center in South Central Los Angeles dedicated to expanding access to quality jobs, addressing employment discrimination and improving jobs that employ Black workers. The Center’s vision is to build a world where Black workers thrive in an equitable economy that sustains family and community. For more than 50 years, the UCLA Labor Center has created innovative programs that offer a range of educational, research and public service activities within the university and in the broader community, especially among low-wage and immigrant workers.